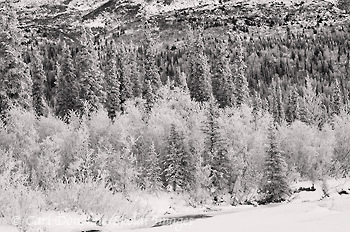 This entry was posted in Adventures, Alaska, News, Photography, Skiing, Snowshoeing, Winter, Wrangell - St. Elias National Park and tagged photo tours, Wrangell - St. Elias National Park on August 7, 2011 by Carl D.
A black and white photo of the boreal photo in Wrangell - St. Elias National Park and Preserve, wintertime, Alaska. Please click on the image above to view a larger version of the photo. And Happy Holidays, everyone! This entry was posted in Adventures, Alaska, Backpacking and Hiking, Cool stories, Forests, Landscapes, Musings, Skiing, Snowboarding, Snowshoeing, Wrangell - St. Elias National Park and tagged boreal forest, Landscapes, scenics, snow, Winter, Wrangell - St. Elias National Park on December 25, 2010 by Carl D.
Winter travel through the boreal forest, in Wrangell - St. Elias National Park and Preserve. Hiking on snowshoes through the snow-covered taiga, white spruce forest in winter. Please click on the image above to view a larger version of the photo. Well, Fall’s well and truly over, now. I skied through a whiteout this afternoon, over in the Chugach Mountains, and decided winter’s here. So I think I’ll welcome the new season with a trip to “the park”, as I call Wrangell – St. Elias National Park and Preserve. The plan is to head over early this week and spend a few days on the north side of the park, snowshoeing and skiing around in the forest. I took this photo last winter on a trip to this same area; it’s always a treat to return and wander through the silent whiteness. Winter is such a fascinating time of year in Alaska, so stark and silent, yet completely amazing. It lacks the vitality of the summer, but owns a kind of sublime depth that simply isn’t present at any other time of year. It’s very alive. Right now it hasn’t yet got down to the crazy winter temps of -40˚, but there should be plenty of snow around. 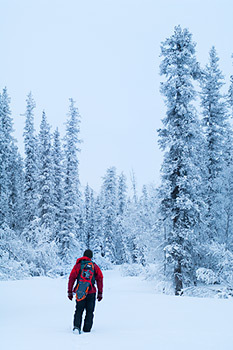 This entry was posted in Adventures, Alaska, Forests, People, Snowshoeing, Travel, Winter, Wrangell - St. Elias National Park and tagged Adventures, Landscapes, scenics, snowshoeing, Winter, Wrangell - St. Elias National Park on November 8, 2010 by Carl D.
Photo sale to the CIA. Winter snowshoeing, boreal forest, Wrangell - St. Elias National Park and Preserve, Alaska. Click the image to view a larger version. All photo sales are unique, but this one was pretty weird. My phone rings around 5:30am, I kinda half open my eyes, clasp for the phone, miss, knock it off the table beside my bed, try to catch it, bang my head on the guitar standing against the wall, drop the phone, and it crashes to the floor. My go-to response in this situation is pretty simple; I curse. It’s a sin, I know, but it’s a hard habit to break. So I curse again, and then pick up the phone. 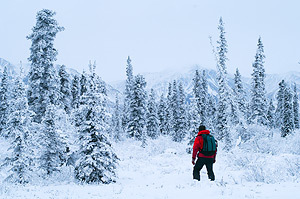 This entry was posted in Adventures, Alaska, Cool stories, Snowshoeing, Wrangell - St. Elias National Park and tagged boreal forest, CIA, forest, hiking, snowshoeing, Winter, Wrangell - St. Elias National Park and Preserve, Wrangell St. Elias on February 5, 2010 by Carl D.
All material posted to Skolai Images is copyrighted to me, Carl Donohue. It belongs to me. Do not use without permission. Thank you.